Tracks featuring the following players: Debalin Das, Ian Streatfield, Gary Wren, Gary Hinton, Martyn Lawrence, Steven Turner, Steve Mac. Follow us on Twitter @HTWires. High Tension Wires meet once a month at the Blackheath Ruby Club for rehearsal with band leader Steve Mac. This Is my Kala Tenor Ukulele. I’ve had it for a year now and I must say it’s been really fun learning to play it. Like a lot of guitar players I have been drawn to the ukulele through promotions in the guitar world magazines like “Guitarist” The Promotions set out to try to make the ukulele cool and get as many guitarist to make a move into the Uke world. The Tenor Uke is a great instrument and sounds particularly good in the mix of a number of different guitars. 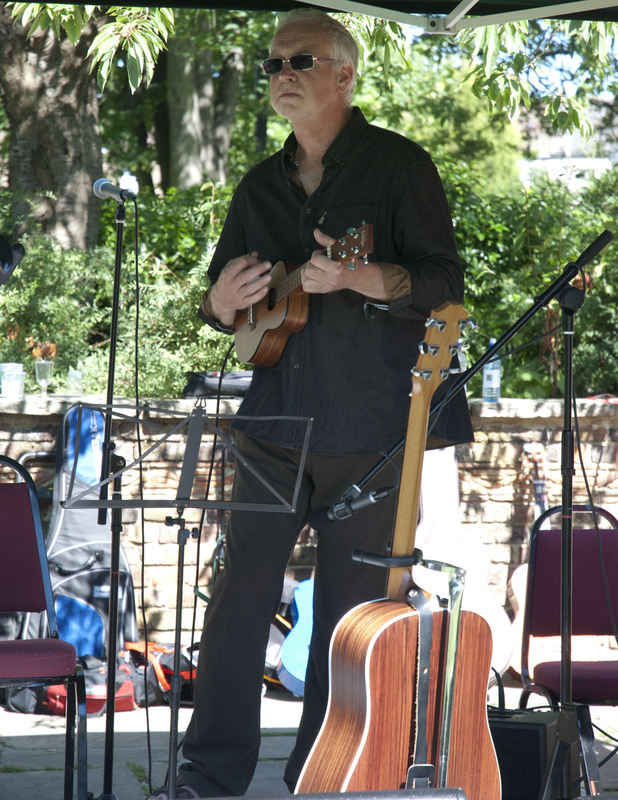 In the High Tension Wires acoustic group that I run we now have 4 Ukulele’s and when mixed in with a couple of 12 strings guitars, a steel strung six string and a nylon the Uke’s higher pitched voice sounds great. This guitar is my current number 1 nylon. It’s the guitar I use in all of my restaurant work and I’m really happy with it. I bought it in Hanks in Denmark street 3 years ago and have pretty much played it on every gig since. I originally wanted the cutaway model of this guitar only to find out when I arrived at the shop that it had been sold about an hour earlier. After tying several makes and models in the shop this Raimundo was for me by far the best. The guitar has a very compact size and is very comfortable to play. The pickup is a fishman which has a very loud and clear output so like my Taylor 314ce I need to be careful and not sit too close to my AER Compact 60 or my AER Domino to save any feedback issues. It would be nice to have a feedback buster in the soundhole but the soundhole is smaller than a standard size so unless Raimundo have their own…I’m not sure. I love nylon guitars, the sound is perfect for the restaurant work I do giving a very mellow relaxed type sound. If you are a steel strung player and you have always felt that nylon guitar necks are way too wide and uncomfortable to play, try the Raimundo or indeed some of the Yamaha guitar and I think you would change you mind. They have kind of met the guitarist halfway with a neck width that’s inbetwwen the steel and nylon producing a hybrid size which is perfect for fingerpicking without being too wide or small. I plan to put some recorded tracks onto the site soon so you can hear the Raimundo in action. This is my Baby Taylor guitar, I bought this when they first came out around ten years ago and still use it today. It’s a 3/4 size guitar but has a surprisingly big sound for it’s size. I added a sound hole pick up for live use as this guitar makes an excellent backup steel string to my main Taylor 314CE. Another great thing about this guitar is it’s the ultimate travelling guitar. When It’s in it’s padded gig bag it fits perfectly into an aeroplanes overhead luggage compartment so boarding with the guitar as hand luggage is not a problem. Taylor have just released a new 3/4 called the Taylor GS Mini which is receiving some very good reviews at the moment. I was watching a performance on tv recently by Damon Albarn and he was using one and it sounded great. It must be such a difficult job to get a big sound out of a small area but Taylor seem to have cracked it. 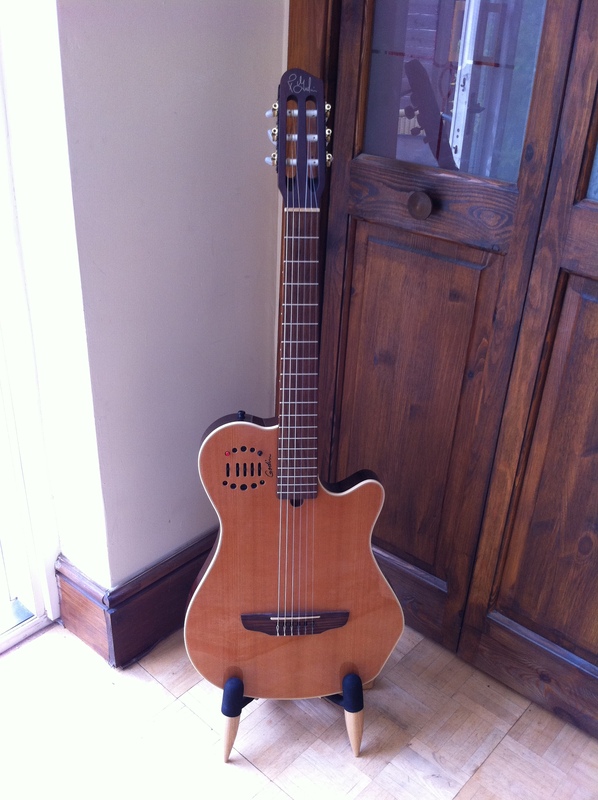 My Baby Taylor is a really great little guitar, It’s a great all rounder and is perfect for teaching as it’s so easy and convenient to carry around. If you ever get the chance to try one take it. On a blind fold challenge you would swear it was a full size!! Here is my Godin Multiac Grand Concert Duet Nylon which I bought last year for a bargain price at Acoustic Avalon. It is the slightly cut down version in that it does not have Synth Access, but it is remarkable in that it is virtually a solid bodied classical guitar with some chambers and fancy electronics which reduce feedback. It has a low action and plays almost like a solid bodied electric guitar. Like most of my guitars, it is quite heavy, and I would love to know why I keep buying such heavy guitars? By the way, Acoustic Avalon is an acoustic guitar show run by Sheehans Music, Leicester, with almost non-stop acts on stage over the weekend. There is also a live show is on Saturday night with several headline acoustic acts. I learnt about Acoustic Avalon as a particular hero of mine, Eric Roche, had connections with the event before his untimely passing. Like Steve Mac I am left handed, but unlike him I play the “conventional” right handed way. It makes more sense to me as my most adept hand is my left hand, and which one does more work when playing guitar? This means that all you right handers out there have got it wrong. Hi Everyone, This is my current Number 1 steel Strung acoustic guitar and it’s a beauty. It’s a lefthanded Taylor 314Ce. I have had this guitar for a year now and it’s very dear to my heart… I’ll explain why. Just over a year ago my father passed away, he was always very supportive of me and my music and was very proud of what I do. I bought this guitar in his memory and every time I play it I almost feel that he’s close by so it’s very special. The guitar itself is a wonderful instrument, it sounds amazing producing a lovely clear sound with plenty of volume. The neck is very slim and the overall playability is great. Plugged in, the on-board ES system produces a very natural sound through my AER compact 60 although I have had to use a feedback buster inserted into the sound-hole on occasions to stop some feedback when I’ve had to play sitting close to the AER . I bought the guitar from Strings direct. They have a section of the store which is called “Lefties”. Over the years I have become a good customer as it’s one of the best guitar stores in europe for lefthanded guitarists like myself. A big thank you to store owner and fellow lefthanded guitarist Steve Jolly for his support and deals that he has given me. If you are in the hunt for a great acoustic I would recommend you check one out. You won’t be disappointed!